One of the most popular areas in which to participate in Boone North Carolina Skiing, Appalachian Ski Resort is the total package when it comes to winter fun. With NC Snow Tubing, North Carolina Snowboarding, Boone North Carolina Skiing, ice skating, dining, shopping, spectacular views, and so much more, Appalachian Ski Mountain is one of the best Ski Resorts Near Boone NC. With 11 fabulous slopes and 3 terrain areas, Appalachian Ski Resort is a fantastic place for experienced riders as well as beginners. Appalachian Ski Mountain is known the world over for its renowned French Swiss Ski College, and offers lessons for skiers and boarders of all levels. If you’ve never skied or snowboarded before, you’ll want to check out Appalachian Ski Mountain’s French Swiss Ski College, the oldest and most distinguished ski school in the South. The instructors at the French Swiss Ski College have taught Navy Seals, Green Berets, West Point instructors, Marines, and even Secret Service Agents how to ski and board. If the U.S. government trusts the French Swiss Ski College to train some of its most prestigious servicemen and women the art of Boone North Carolina Skiing, it is no wonder that over one million everyday folks have chosen Appalachian Ski Resort’s French Swiss Ski College to teach them how to ski and board. In addition to military men and women, Appalachian’s French Swiss instructors have been instrumental in training numerous disabled athletes through the Special Olympics program, and have even managed to teach people who have never seen snow before to ski and board with ease. The French Swiss Ski College recommends that individuals seeking to learn how to ski or board take three separate lessons from professional instructors, citing the fact that many first-time riders become discouraged by their first lesson and never return to the slopes. These people often seek the assistance of their friends, who are not certified to teach skiing or snowboarding. Based upon their many years of experience, the instructors at the French Swiss Ski College predict that after three lessons with a certified instructor, individuals will feel comfortable on the snow and will have gained enough control to safely put their Boone North Carolina Skiing skills to the test on the more advanced NC Ski Slopes. They have narrowed these lessons down to a science: during the first lesson, students will learn to keep their balance, slide, and remain upright; during the second, they will practice on intermediate terrain; and during the third, they will become confident on intermediate terrain. The French Swiss Ski College is built around the philosophy that anyone can learn to ski, and the patient, laid-back instructors promise that your experience will be both fun and rewarding. With the help of Appalachian Ski Mountain’s French Swiss Ski College, anyone can learn the skills he or she needs to cruise the North Carolina Ski Slopes with confidence and style. 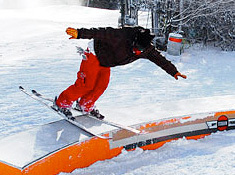 During the 2010/2011 ski season, Appalachian Ski Mountain will be offering a variety of lessons for both beginners and those who want to improve upon the skills they already possess. Learn to Ski or Snowboard Packages are offered at the beginning and the end of ski season, and are a great way to ensure that your introduction to the winter sport of your choice is easy, fun, and inexpensive. Tickets can be purchased in the lower level of the lodge, and a 1-hour group ski lesson with equipment rentals and beginner ski ticket is $42, while a 1-hour snowboard lesson with equipment rentals and beginner ski ticket can be purchased for $54. Offered all seasons long, these classes are small enough that students can expect individual attention from instructors. These lessons are ideal for ages 6 and up, and the instructors can accommodate skiers and boarders of every skill level. One hour’s worth of group lessons can be purchased at a cost of $17; 2 hours of group lessons in one day will cost $32; and three 1-hour group lessons in the same day costs $46. Lessons are offered at 9:30 AM, 10:45 AM, 1:30 PM, 6:30 PM, and 8:00 PM. These lessons are ideal for skiers or boarders of all abilities. A fantastic way to learn to ski or ride, students who attend private lessons are guaranteed personalized attention and instruction tailored to their specific needs. Lessons are offered at 9:30 AM, 10:45 AM, noon, 1:30 PM, 2:40 PM, 6:30 PM, and 8:00 PM. A 1-hour lesson is $42; to add an additional student, expect to pay another $17. Ultimate Private instruction promises a “big improvement in a few short hours,” and reservations are suggested. Three 1-hour lessons cost $120. SkiWee is great for children ages 4 to 10, as SkiWee instructors are specially trained to teach children the skills they need to ski well and be safe on the North Carolina Ski Slopes. Children will enjoy learning while they play and have fun, and the professional instruction they receive from the French Swiss Ski Schools certified professional will give them skills that will last a lifetime. A full day of SkiWee (from 9:30 AM to 3:30 PM with a break from 11:30 AM and 1:30 PM) will cost parents $70, while a half-day (1:30 PM to 3:30 PM) goes for $50. Guests can register for any of these fabulous programs at the Ski School desk on the lower level of the lodge. When you take lessons with the French Swiss Ski College, you can rest assured that you’re receiving lessons from some of the most certified instructors in the country. With a reputation that precedes it, the French Swiss Ski College atAppalachian Ski Mountain has trained people in prestigious positions, and can provide you with the same high-quality training at bargain prices. SkiSoutheast.com has all the information you need to plan your next ski vacation to Appalachian Ski Mountain. Our Trip Advisor can help you find North Carolina Snow Cabins, Cabin Rentals in Blowing Rock NC, and even Lodging Boone NC. Whether you’re planning a trip to the Ski Resorts Near Boone NC, the Banner Elk NC Ski Resorts, or any of the other great North Carolina Snow Ski Resorts, SkiSoutheast.com has all the information you need. We can also help you plan your next trip to the Best Ski Resorts West Virginia, The VA Ski Slopes, Ober Gatlinburg TN, Cloudmont in Alabama, or Wisp Resort MD. We have all the latest information on all of your favorite ski resorts, so make sure to check out our site the next time you decide to plan a ski trip to the Southeast or the Mid-Atlantic.